Black and Gold; two colors ever remembered in the tumultuous forging of a great nation. Oil and Gold; two commodities upon which has been built the greatest of world economies. Representing economic influences that span the globe, Cabot Guns is proud to introduce the Trade Commodities. 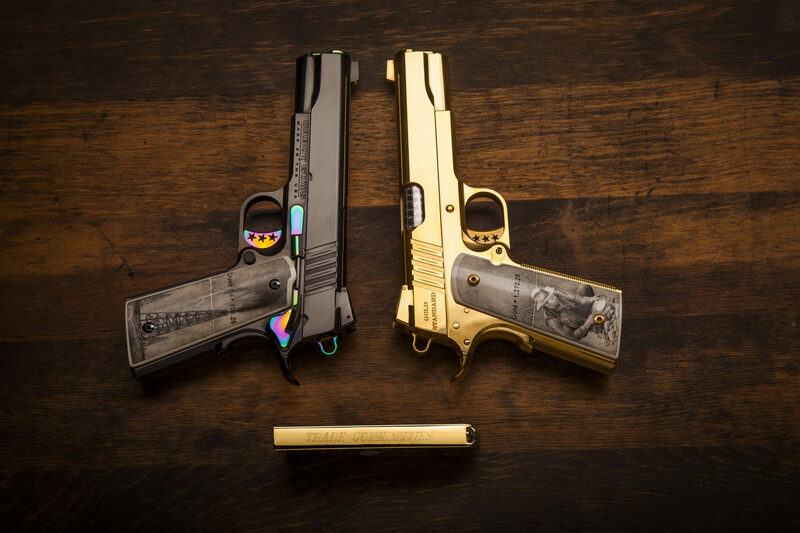 Named for the value assigned to both Gold and Oil as examples of two of the four staple commodities which have driven economies for countless centuries, these pistols are art become machine. A collaborative design envisioned by Cabot President Robert A Bianchin and patron Steve Nakonechny, and given life by Cabot Guns, the Trade Commodities bring an artistic flare to a field otherwise dominated by utilitarianism and devotion to function in its most pure form. As individual pistols, the Trade Commodities are impressive – as a set, they are un-paralleled. The light cast from the gold is absorbed and radiated by the black, warming both to the eye, capturing the imagination and personifying the dreams of generations. 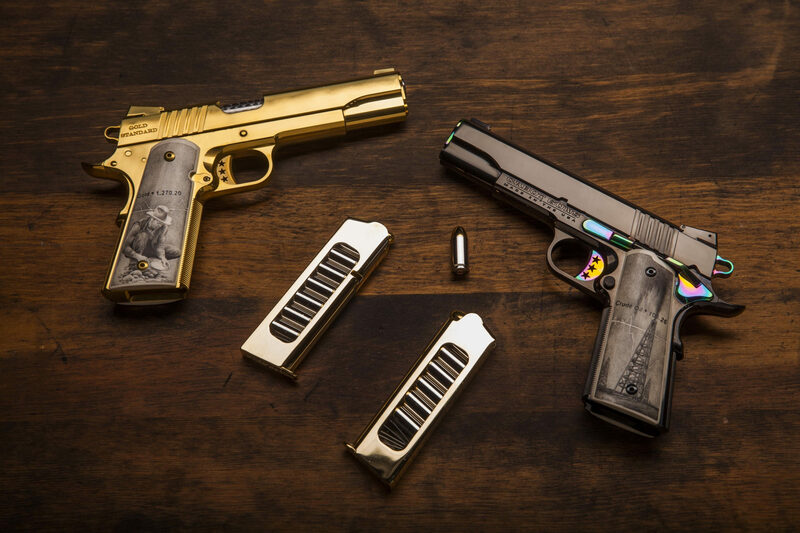 A perfect pair of right-handed pistols crafted to Cabot’s revolutionary C Class of full clone technology standards – every part and internal fitting can be swapped between the black and gold, exemplifying the interdependence of oil and gold in the world economy. Both pistols are an embodiment in every respect of the obsessive-perfection Cabot’s team is committed to. The Gold Standard pistol features a finish of TiN – Titanium Nitride, giving it the luster of the precious metal for which it is named and stimulating human spectral sensitivity with massive aesthetic appeal that may be traced as far back into history as 2600 BC Egyptian hieroglyphs, and is also frequently mentioned in the Old Testament. Its name, The Gold Standard, is a nod to the monetary systems which based the value of goods on a fixed quantity of precious gold, and considered it to be a commodity in economic trading. Framed by the ejection port is a peek at a beautifully jeweled, match-grade barrel – complimented too by a jeweled full-length guide rod capped with Cabot’s signature star logo at the forefront. The Black Gold twin captures a deep black near-colorless infinity with its Physical Vapor Deposition, Diamond-Like Coating (PVD DLC) – bonding at the molecular level an extremely durable, yet elegant finish. The small parts; Cabot’s Tristar Trigger, hammer, thumb safety, slide stop and barrel are also coated using this method – but instead of jet-black are a rainbow emulation of the luminescence observed by the naked eye when looking upon the sheen in even a single droplet of oil. Each pistol has its own modified magazine. Both are gold-plated 18 karat and display their one-off contents of nickel and 24 karat gold plated cartridges viewable through a window-like opening added to each magazine. These magazines, a feature of paramount importance in the 1911 platform, open themselves to show off the intricate simplicity of John Moses Browning’s timeless design. Adorning the frames of the set are grips custom crafted of Ivory by artisan Dan Chinnock, a master craftsman devoted full time to the pursuit of perfection in the primary interface between shooter and weapon – the grips. Each grip panel is individually created by Dan to the highest standards of a perfectionist in the 1911 industry. What sets these pairs apart though are the one-of-a-kind hand inscribed designs incorporated into the Ivory by artist Darrel Morris. The technique he uses is termed scrimshaw, and was birthed on the tall-masted whaling ships of the mid-1700’s when sailors would create elaborate carvings in tusks, bone, baleen and teeth of those animals they encountered on their voyages. The lost art has been preserved, and is expertly applied by Morris in his etchings; both of a prospecting 49’er panning for the most precious of metals and of an oil derrick reaching into the depths of the earth to unlock ancient wealth. Each too is inscribed with the stock-market-index price and chart for each of these commodities, as observed between May and June of 2014 – when the work was commissioned. Together tying the storied history and current relevance of these two economic staples and immortalizing them in art. No work of art deserves to be hidden from view. Cabot Gun’s President Rob Bianchin tackled that issue in a collaboration with Mauro Vedovello and commissioned through him a custom-case be built in Brescia, Italy. It protects its valuable contents behind custom-fit sheets of ballistic grade acrylic, and features a hydraulic-assisted door which caresses the auditory senses as its arms seem to “breath” upon opening the case lid. The frame itself is aerospace grade aluminum and is finished with elements of copper and brass accents. Once open, the magazines pivot up for display secured upon magnetic bases. The Trade Commodities themselves pivot upwards too – reaching for the sky akin to the black-gold geysers of old as prospectors struck oil in the efforts to harness millennia-old crude. An accomplishment in its own right, the case is designed to cradle the Trade Commodities as it displays them to an awestruck audience.